Today is my stop on the 318 Patchwork Patterns blog hop. If you haven’t heard of this fabulous book before, then you are in for a treat. 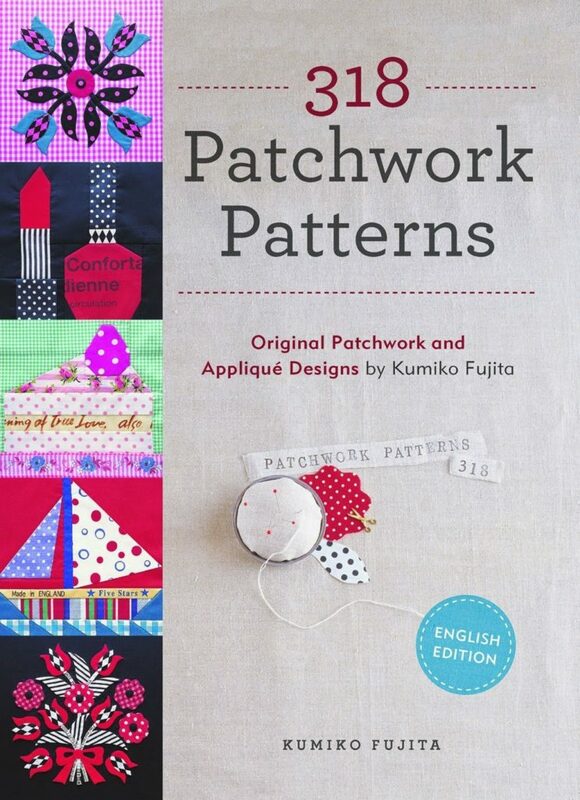 After being out of print for many years and only available in Japanese, this collection of 318 patterns is now being republished and available in English. During the blog hop you will see all sorts of different blocks from the book. 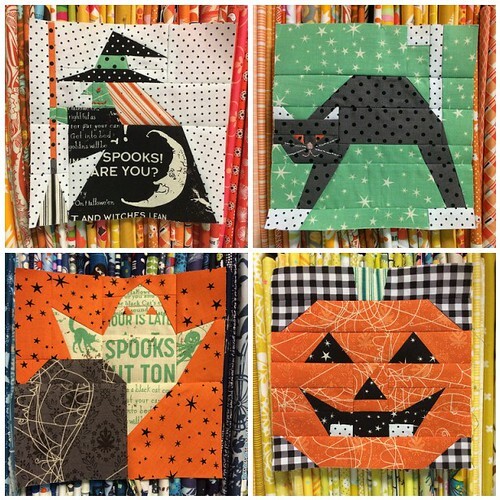 But I took advantage of the timing of this blog hop and jumped straight for the Halloween blocks. There is something so charming about them. I chose 4 of the 6 blocks to make into my bunting. Another nice tip is to make a map of sorts of the fabrics you plan on using for your block and color your block so that you can easily see what the tiny pieces should be once the block is all cut up. I make a little guide for myself with scraps of the fabrics and a list of what they will be used for. Then I break out the colored pencils and give myself a rough guide. And then I made four blocks! I’m not particularly fast nor ridiculously slow…so I say that each block takes me about an evening to make. Especially if you include all the prep work of enlarging the block, drawing and numbering for paper piecing, and selecting fabrics. But the beauty of paper pieced blocks cannot be denied. They are picture perfect…with some careful attention to matching seams. I didn’t want another wall hanging or quilt, so I decided to make something a little different and went with a decorative bunting. I used a woven interfacing to line the back of each pieced block to provide stability and then sewed them into a little “pocket” with the orange polka dot fabric. I wanted the back to be completely finished. I interspersed my pieced blocks with some fun burlap that I added raw edge appliqued letters to. A simple “BOO” says it all. Then I sewed them at evenly spaced intervals to a double fold bias tape (one package did the trick). And tada! A holiday bunting that I will definitely use for years to come! For me it is all in the details. A bit of hand embroidery. Carefully fussy cut fabrics lined up to match. And using just the right fabric for each little part. Oh and by the way, this fabulous line of fabric is called Witch Hazel and is available now from Riley Blake fabrics. In fact you can probably find it on sale since we are so close to halloween. Fun fabric and giveaway! Thank You. I've been following your bunting on IG and it is just darling. Cute blocks! Thanks for the giveaway! You are right. The details are wonderful in your blocks. I especially love the witch! Your mantel looks great. The burning is cute. I also like the framed initial. Lovely bunting, I especially adore the cat! I think the ghost behind the tombstone looks a little like Yoda. Love your bunting – such cute blocks! Thanks for the chance to win, this book is definitely on my wishlist. It looks like hours of fun! The blocks are very cute and I loved how you turned them into bunting. I will actually go looking around to see if I can find that fabric on sale since yours is so cute. I don't like the thought of doing something exactly like someone else has, but I might have to relent on that a bit. 🙂 And I love the Mimosa fabric! The bunting is gorgeous. Thanks for this giveaway. Thank you for the review and giveaway! I love the Halloween blocks! So pleased this book has been reprinted in English! Your halloween bunting turned out great! Thanks for the giveaway opportunity! I love this fabric so much I pinned it to my favorite fabrics board! Thanks for a chance to win one of these lovelies! Fabulous bunting – well worth the hard work involved! Would love to win a copy of the book as I have seen several blogs refer to it in the past. Beautiful fabrics for the giveaway – thank you for the chance to win. Such a fun holiday project! Very cute! The witch block is my favorite. Fun blocks – thanks for sharing & thanks for the chance to win. What an awesome idea! Thanks for sharing it. Gorgeous bunting!! Love your fabric choices! LOVE the patterns and fabric!!! Thank you for the chance to win. love the halloween bunting! and all the inspiration! Cute, cute, cute! Have fun at market! That bunting is so cute! It looks great! thanks for the giveaways! You are very good at fussy cutting! I really love your fabric choices and the way that you interspersed the 'Boo' letters with your pieced blocks. I also love the framed 'P' on your mantel piece! Great idea. 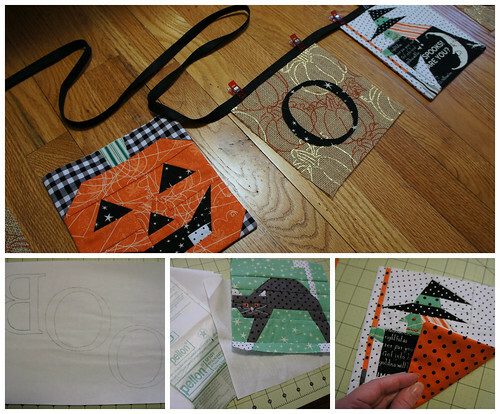 These is a wonderful project: a very precious Halloween bunting with that perfect paper piecing! I've dabbled in simple paperpiecing and found that tricky but your talent amazes me! WOW! Beautiful and perfect!!! ps the witch block is my favorite and then the cat, and then the pumpkin… oh man! love them all!! Such cute blocks!! Great job!! Love your Halloween bunting! I'll put that on my list for next year! I love that you used pumpkin burlap. Did it come that way, or did you print it? Lovely bunting! Oh, these patterns are wonderful! And the fabric choices are the best! Thank you for the chance to win! Sounds fun! Thanks for the opportunity! Your bunting makes me wish I had a mantle. What an adorable Halloween bunting! I think I would really like to make it for my mantle next year. Thanks a bunch for the drawing too….. Your bunting is so cute! Looks like a great book. and oh those fabrics would work great in my newest project the flower garden quilt…. Love your Buntings! Halloween is so fun! These would be perfect for a Spooky Party! How fun to do a bunting! I love the green color in the fabric – not expected in Halloween fabric but it fits wonderfully. The bunting is adorable! And love your piecing of the ghost! Wow, you have just convinced me that buntings are cool. What a great book. This is great bunting. My kids would love me to do something like this for Halloween and other Holidays. I love the fabric choices and the innovation of this project. Thanks for sharing!! Fun fabric and such great giveaways. And your block are so cute. What a lovely giveaway. Your bunting is perfect. I love that you made the blocks into a bunting. So cute! I LOVE paper-piecing, finally, after many attempts gone bad! Haha! Super cute bunting. Thanks for the sweet giveaway. Those are super cute! I'm still intimidated by paper piecing, but all these posts about it are encouraging me to try it…soon. The bunting is super cute! I absolute love paper piecing projects and these are super cute blocks. I love the fabric! I would make a throw and a pillow. Your blocks are so cute! I love your banner idea. I love the idea of a Halloween bunting! And your adaptions of the patterns to paper piecing. Thank you for this chance at your giveaway. I love your bunting, wonderful job! Your fireplace and mantle are so "fall festive", just beautiful! Thanks for the giveaway! Awesome giveaway! Love the Halloween bunting! What great bunting–and so easy to store for next time! I'm in love with Blueberry! Wow- that book looks like so much fun! Lots of good projects to make with my daughter! Thanks for all the tips. I love your blocks. I love how you decorated your mantel! Such a clever project! LOVE the witch block, oh my, I'm blown away 🙂 Thanks for sharing all you do, it's inspiring, even to this "old" stitcher! I can't even imagine, those eye pieces are so tiny! I love that Halloween bunting!! That book looks awesome. Thanks for this post and giveaway! 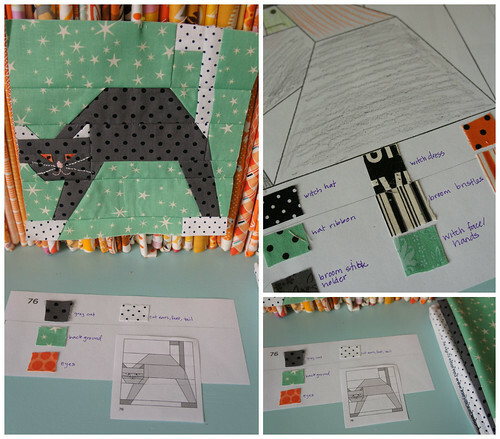 I'm really liking all the tips for making blocks using the book. Each tip makes it seem more doable! Your bunting is so cute. Thanks for all the technical "how-to" that goes with this book – really helpful!! Love your bunting! Your blocks are fabulous – you are just so creative!! Eeeeep – of course I love the look of this book 🙂 I love your bunting too – paper piecing is awesome! It is fun to see your Halloween version of some of the blocks. Thank you for the chance to win. What a fun giveaway! Thanks for the chance to win. Cheers! Your bunting is fantastic! I really love the fabrics you used too. I've just started getting into paper piecing, and as a perfectionist, it's pretty much the greatest! 😉 Thanks for sharing how you altered the patterns to make them work for paper piecing. That cat has such character. Great idea to make bunting to put your blocks on show. Such fun blocks, thanks for sharing some tips on upsizing them as well. Your blocks are so fun looking. Great job. Very cool. THis looks like a great addition to my library. I love blog hops and all they offer in the line of creativity. Your banner is adorable. Isn't it great to have something already to decorate each year…something hand-made. I would love to win the red bundle and I promise to put it to good use! Love the Halloween bunting. I also love to paper piece too. Love your blocks and the give away. Very cute bunting! All those Mimosa fabrics look good enough to eat but, I think the Blueberry one will do it for me. Thanks! I'm crazy about that cat block … and Mimosa in the blueberry colorway! What a delightful banner! And I love the colors in the Grapefruit Memosa. Awesome blocks! Loving the Blueberry Mimosa, such a pretty pale blue. Great job! I love the blocks. Thanks for the chance to win a great book. Wonderful bunting. Thanks for sharing. I love the Mimosa collection it is just so pretty and I can see not only doing a quilt but I could make so tops with it too! Paper piecing rocks! Thanks for the giveaway. Your bunting is delightful! It is really an heirloom, given the level of detail and precision in the blocks. It will delight people for decades! Thanks for sharing this, and thanks for the great giveaway too! Love the book and your bunting looks perfect! The blocks are wonderful. I am going to have to get a copy of Mixology as well. It looks like a great book. Really sweet blocks and giveaway! Thanks so much for the chance to win! Love the paper pieced cat. I'm trying this evening . Thanks for the giveaway, it's so generous. Pomegranite Mimosa is me. Darling idea and excellent execution. Great explanation of all your decisions, too. Thanks. I love the banner! I have wanted to paper piece for awhile, but have never gotten the nerve up to try! All four sets of the mimosa fabrics are beautiful as well!!!! I love your Halloween bunting! The black cat and witch are adorable! Great bunting! I love Halloween decorating. Thanks for the chance to win these great presses. Those blocks are so cute! and the bunting is a terrific way to show them off! Thanks for the chance to win some great fabrics! Great choice for the bunting! Thanks for the giveaway. That book looks full of great ideas. This is awesome!! I'm a bit intimidated by it all, but would love to try and learn! Love your blocks! I'm so happy this book is being printed!!! Your blocks turned out so cute and I love that you made them into bunting! This is so cute…makes me want to make one right now!!! Those are tiny pieces – even at 300%. Thanks for the chance to win. You do great work. I never knew how this was done, thanks for telling. Thanks for the great giveaway! 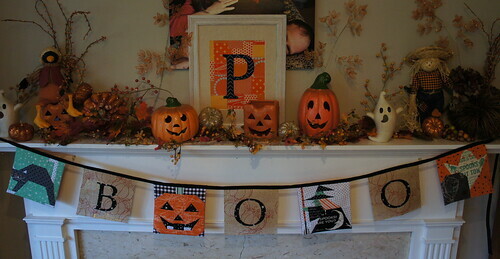 Love the Halloween Bunting – would love to do something similar for my home for Christmas. I love all of your Halloween projects! Very inspiring indeed. LOVE your Halloween banner. So fun! love the bunting! How fun! Thanks for the chance to win your great giveaway! I just love seeing what other people do! Wow I love the bunting! Thanks for the chance to win and a great give away it is! Would love this book and some gorgeous fabric too! Amazing Halloween bunting! I love your little details. I've been wishing for this book for a long time! How do you convert those drawings to Paper pieced? Wow. Great job! Thanks for the giveaway. So cute. Love that the book is in English now. Love your bunting…..so cute. This book looks awesome! 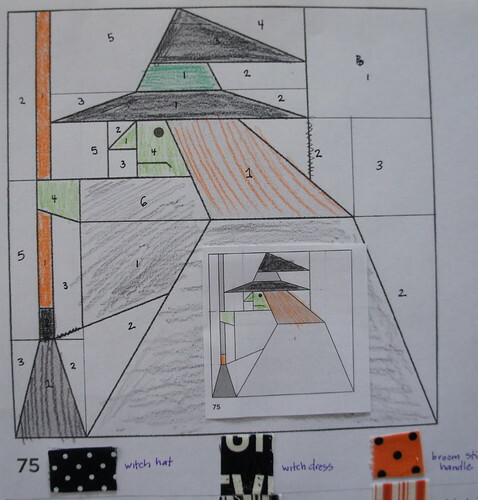 The Halloween bunting is great and your blog on paper piecing it was really good too. The books sounds really good thanks for the chance to win a copy. Your bunting is so cool!! My Daughter would love one….might make her one, for next year! 🙂 What a fun Give-a-way! Book looks Super & the fabrics are all Beautiful too!! Ur bunting is so nice. Hope to win . thanks. I love your bunting! I hadn't realised the patterns were intended for hand piecing and am thrilled because that's my preferred method! 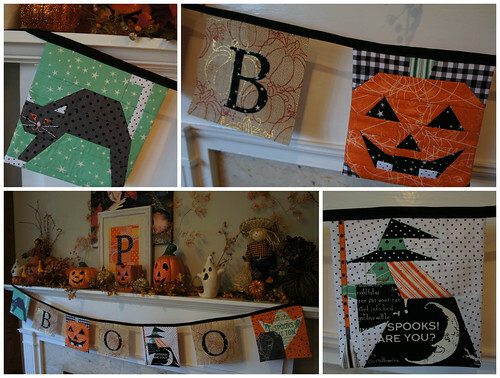 Your Halloween bunting is adorable…I love it! Thank you! Wow! What an incredible giveaway. I was following your quilt market adventures on IG. Look forward to hearing more about it! The bunting is adorable! I love the colors on the Mimosa line! I love your bunting. The cat one is my absolute favourite! The colorways are all so fresh and fun! Thanks for hosting this giveaway. Very cute! I would like to try paper piecing again. I did it once and got a bit overwhelmed but in hindsight I was new to quilting at the time and bit off more than I could handle. I would love to win and try a few blocks from this book! I love the witch and cat blocks and the book looks like it has so many blocks that I would actually use. Thanks for the giveaways. Fantastic book and fabric! Thank you for the chance to win. What a great book. Thanks for the giveaway. The blocks are so cute–love your idea for the banner! Cute bunting. Looks like a great book. Thanks for the chance. Oh love this – thanks for the chance! Very cute!! Looks like an awesome book! Love your Halloween blocks! Awesome giveaway too. Hope I'm not too late to the game! 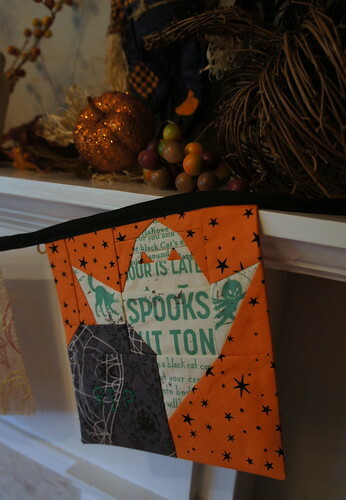 Wonderful the giveaway…love your Halloween themed bunting. The book has some amazing ideas! And..Mimosa is such a fun, perky colored collection.